Famous Accountants is a Bushwick gallery which has been written about in the New York Times, The Brooklyn Rail, L Magazine, The Village Voice, New York Press and Time Out New York, BushwickBK, Hrag Vartanian, Bloggy, Brooklyn Based, and The Brooklyn Rail. Hybrid Jungle is the 7th exhibition at the space. Please join us for an opening reception on Saturday June 26th from 7-10PM. 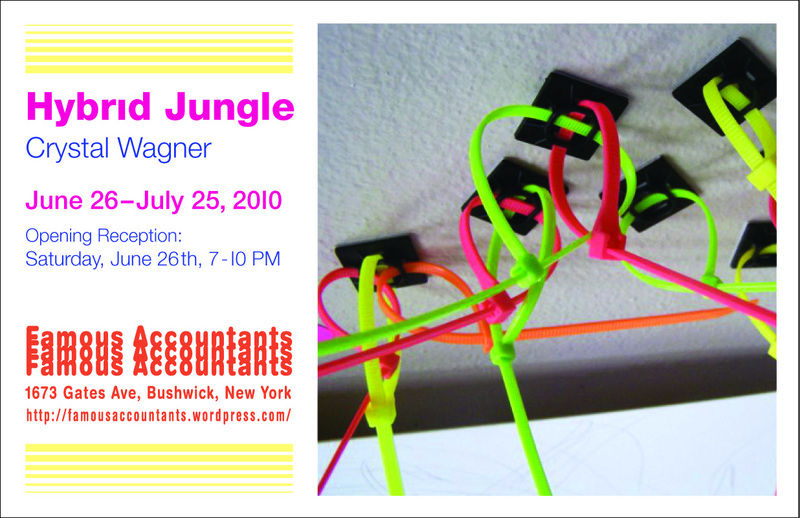 The exhibit will be on view from June 26, 2010 – July 25, 2010. Famous Accountants is open on Sundays 1-6PM or by appointment. Thanks for the post. But it’s Crystal not “Chrystal”. That’s a mistake on ArtCat (that we emailed them about).